It has been a challenging, eye-opening and fun experience co-founding and serving as vice president, now president, of the Hempfield Kiva Club. We provide great opportunities for students to get involved to fight problems like poverty, hunger, and unemployment locally and throughout the world. What’s great about the club is that changing lives is actually easy to do! From a young age, I loved to draw, color, and sketch. It is my favorite hobby and one I hope to incorporate into my career and social change projects, so I am taking art classes to learn techniques and theory. 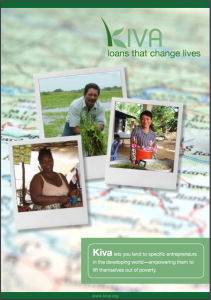 I have enjoyed contributing my graphic design skills toward developing the Kiva website, social media campaigns, and promotions. My love of art and illustration is applied to another passion of mine, engineering. Putting things together and observing their inner workings has always fascinated me, so I love being able to make and draw new concepts that I can bring to life through programming and engineering applications. Those two activities don’t consume all of my time, however. Lacrosse is a big part of my life, too. I started playing the sport after a friend brought me to a pick -up game when I was in fifth grade, and I immediately loved it. Now I play defense for Hempfield High School and my club team, PA RoughRiders. Playing lacrosse actually enhanced my understanding of how I can help people and the importance of giving back. The Hempfield Lacrosse program supports Toys for Tots that helps families who don’t have extra funds to give their children Christmas gifts. The first experience I had helping out through the holidays really opened my eyes to the world outside of my own, and some of the problems people face to give their children the best life they can. There were lines around the building on freezing cold mornings, with moms and dads waiting from pre-dawn so they could give their children a few special gifts. The power of peoples’ commitment to improving the lives of their children was incredibly moving. Helping people made me feel great, and even gave me opportunities to try the Spanish language skills I am developing at school to talk with some of the parents. Being involved with Kiva Club makes me feel the same way. 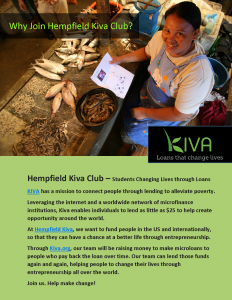 By loaning money to help people all around the world who have bigger challenges to overcome than I do, and sharing our mission with as many people as we can, I know Hempfield Kiva will change many lives for the better. 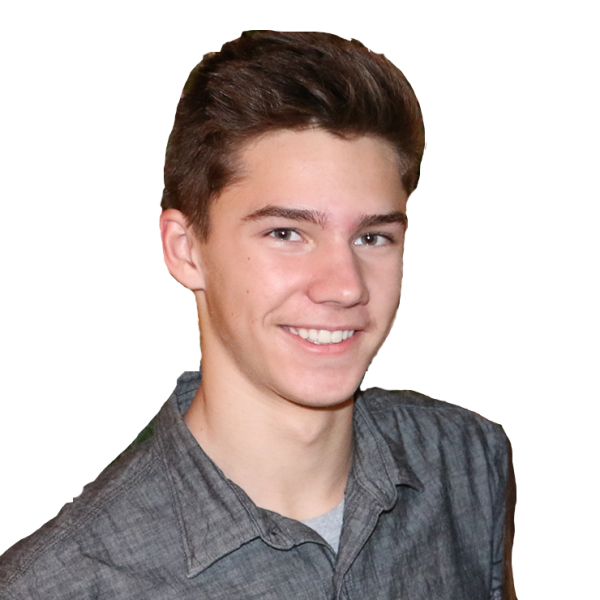 At Hempfield, I am also involved with Ski Club, Environmental Club, and National Honors Society.